Those of you who are well-versed in reading glasses may have faced a summertime reading dilemma. You’re headed to the beach or pool armed with that trashy romance novel or heart-pumping thriller, but can’t decide between bringing your reading glasses or your sunglasses. You don’t want to be one of those people who wear their sunglasses over their readers, but you want to protect your eyes and enjoy your book. So, what’s a bookworm to do? If, you haven’t already been introduced to the wonderful world of sun readers let me to be the first to do so. 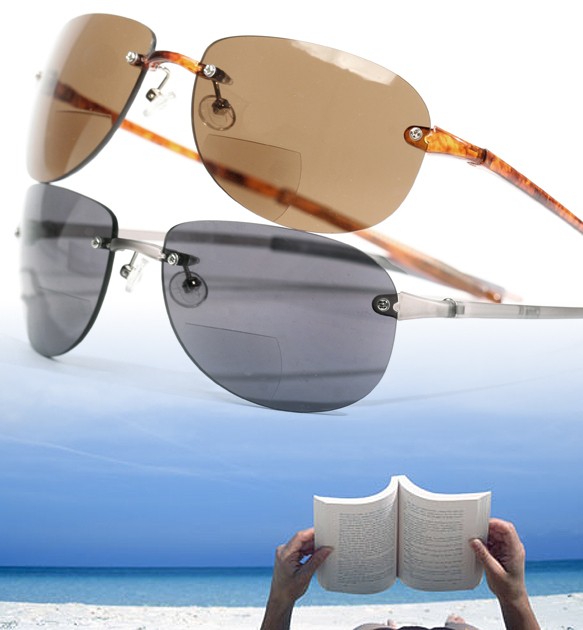 Sun readers are exactly what they sound like – sunglasses with a reading prescription in them. Now you don’t have to double up on your frames or strain your eyes. Now that you’re loving the idea of sun readers, you must be dying to know where you can get some. REM Eyewear had you in mind when they developed their Visualites reading glass collection, complete with six different options for sun readers! These specialty sunnies are designed for comfort and versatility as they’re made with incredibly light and flexible material to ensure that these puppies always stay in perfect shape. Available in a variety of colors there is something for everyone. Get yourself a pair (or a few for that matter) here and enjoy the lazy days of summer.